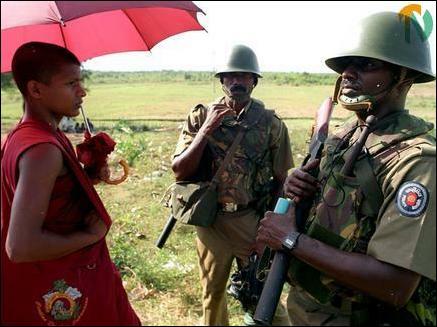 Sinhala nationalist claim that Sinhala Buddhist are the sovereign owners of all Sri Lanka and that no one other than Sinhala Buddhists have any traditional right to land in the island. 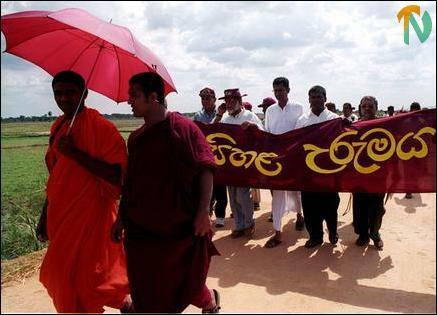 The inflexibly unitary nature of the Sri Lankan constitution is ultimately based on this dogma, legal experts say. Police stopped them at the barrier in Soorankal, a Muslim village near Kurankupanchaan around 4 p.m. The leader of the SU, Mr. Tilak Karunaratna addressed the monks and activists who were in the convoy before returning from Soorankal, residents told TamilNet. "There was no incident", Mr. M.C.M Sheriff, the Divisional Secretary for Kinniya said. 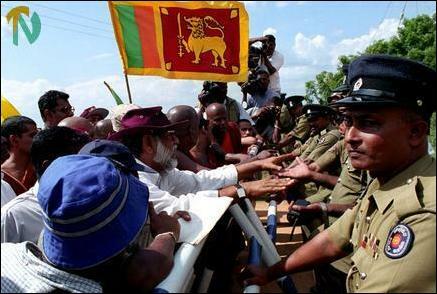 Thirty journalists from Colombo accompanied the SU convoy.